Venmar Ventilation offers 3 central vacuum models to meet all your needs. 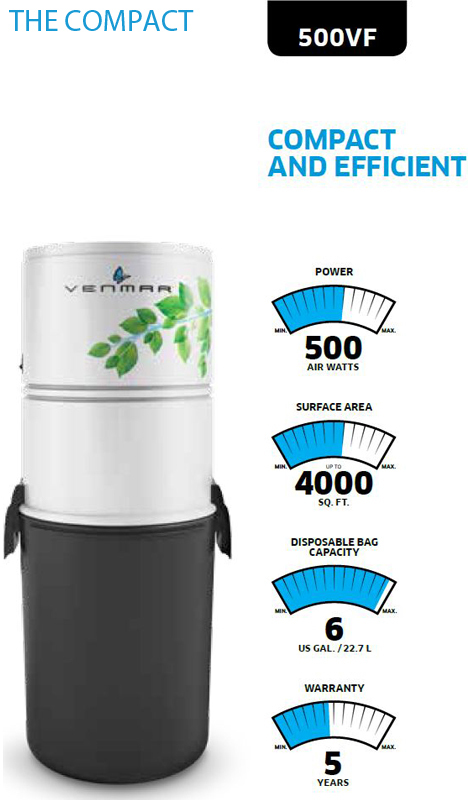 Whatever the size of your home, the type of filtration or the power desired, there is a Venmar's central vacuum model for you! 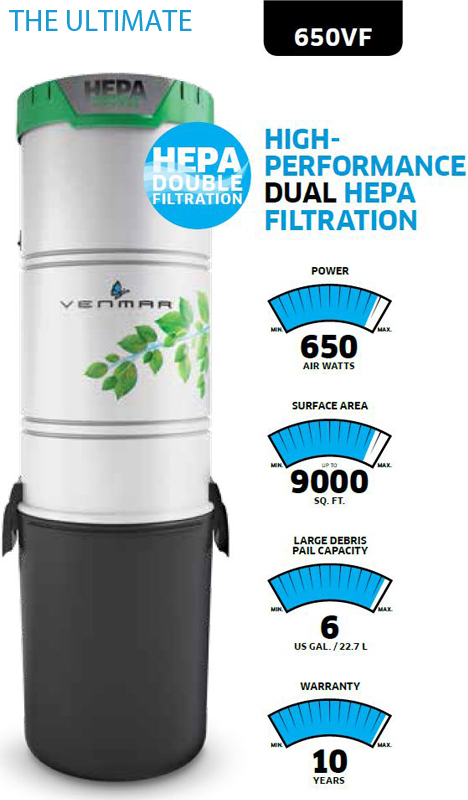 With its high-performance DUAL HEPA filtration, the 650VF model won't exhaust dust or allergen microparticles. This model is ideal for people with respiratory problems such as allergies and asthma. It offers a power of 650 air watts, which will suit any house with an area up to 9000 sq.ft. Offered with a 10-year warranty, you'll have peace of mind for years to come. 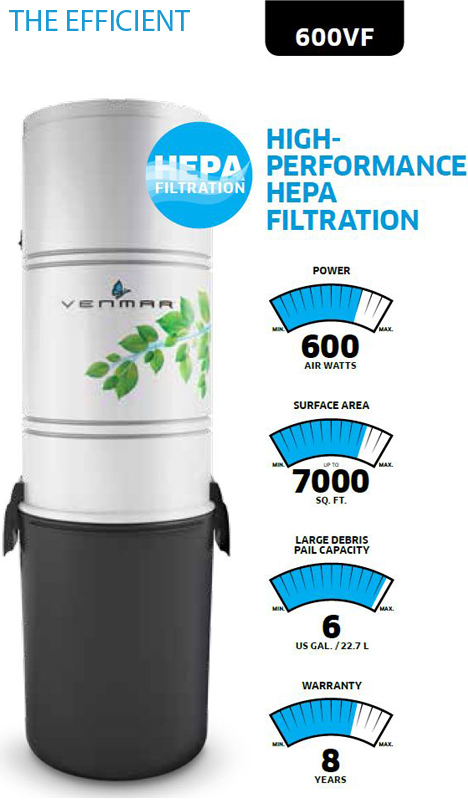 With its high-performance HEPA filtration, the 600VF captures 99.97% of dust or allergen microparticles as small as 0.3 micron. It offers a power of 600 air watts, which will suit any house with an area up to 7000 sq.ft. Offered with a 8-year warranty, you'll have peace of mind for years to come. The 500VF model is compact and efficient. It is ideal for compact space applications It offers a power of 500 air watts, which will suit any house with an area up to 4000 sq.ft. Offered with a 5-year warranty, you'll have peace of mind for years to come. Dust mites, hair, spores, pollen and other microparticles may create an environment conducive to the development of respiratory problems such as allergies and asthma. 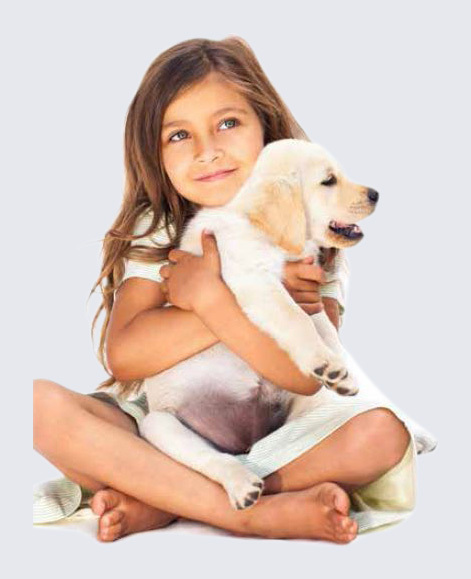 By combining suction power and high-performance HEPA filtration, the central vacuums dislodge dust and other allergens from your home to repel them outside.